A Particularity (a particular entity) has an inside-space and an outside-space. Relatively speaking, inside-space is contained within a boundary and outside-space roams freely beyond the boundary. Inside-space and outside-space are differentiated by their manners of their organization. Our own inside-spaces are dynamically cooperative, full of co-functioning Parts that, as entities, we comprise. Outside-space is largely beyond our control; however, in the vicinity of our outside-space there are other Particularities with whom we Participate. For more about this hierarchy, a previously provided aside is offered again here: The Holarchy. A closed boundary divides the inside-space from outside-space. An open boundary bridges the inside-space with the outside-space. How we perceive ourselves determines, in every instance, whether we bind our inside-space to preclude an onslaught from outside-space, or whether we open ourselves to the myriad potentialities present in the outside-space, including both resources and risks. As Particularities, we are the gate-keepers of our boundaries! Locate these terms in the Pragmatic Schematic (PS) below: EITHER/Spin, OR/Span, BOTH/Spin & Span as equilibrium, and NEITHER Spin nor Span, the stillness/quiescence of the Ground state beyond the PS. Compare magnetic poles to the outer crescents of the Pragmatic Schematic (PS). We see Pulling/Spinning at the left and Pushing/Spanning at the right. The terms Pull and Push are meaningful only with regard to what happens when the poles of two magnets are put together. North and South are arbitrary designations. Opposite poles (N & S) attract or Pull each other together; whereas, N-N or S-S Push each other apart. In the image above, the outer Pull and Push indicate what would happen if exposed to the north pole of another magnet. If we bent the two halved-magnets into semi-circles, their four poles would join together in two sets of S-N, forming a full circle. In such a case, the S-N juncture would be nowhere exclusively, rather it would be everywhere throughout the circular magnet. A single magnet can be cut anywhere and each of the smaller magnets will also have a “north” and “south” pole. Joining two halved-magnets together, like the image below, gives a north-pole/Push and a south pole/Pull together in the center. Similarly, a Push meets a Pull where the two circles of the PS overlap (reprinted below). This interior region is called mandorla or Vesica Piscis. In a previous chapter of this unit, we learned how high and low pressure weather systems are coupled for sustainability. In that chapter and again in the chapter just before this one, we learned about the bidirectionality of Spin. Clockwise Spin (CWS) is centripetal (inwardly oriented) and counter clockwise Spin (CCWS) is centrifugal (outwardly oriented). Spin opens the boundaries inwardly for influx and outwardly for efflux. If the boundaries are closed the Female and Male Pulls and Pushes would have no effect. Spin opens the boundary when appropriate. 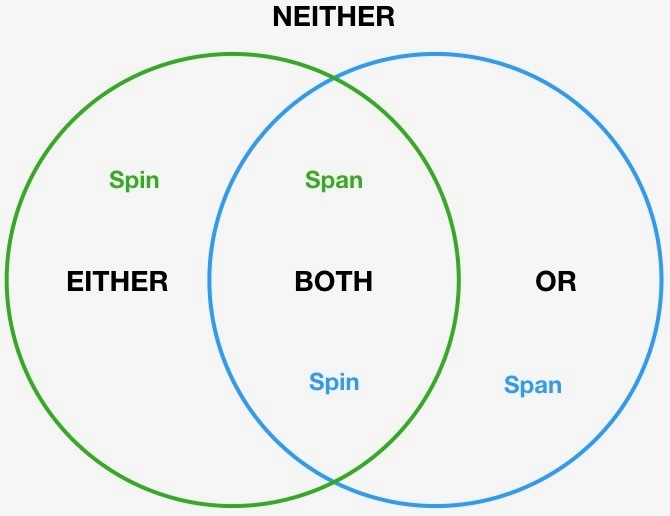 Span is the radial extension of the E/S; when full extension (straight radii) is not warranted, Spin can Pull at the boundary, forcing the radii to curve in order to reduce the overall Span (both surface and volume) of the E/S. A primary premise of Quadernity is that Female and Male aspects couple in feedback, also for sustainability. Employing the understandings of coupled systems and gender aspects of Quadernity, we track below the pulmonary and circulatory systems as if they are inextricably entwined gender-related aspects of a feed-back, feed-forward loop of sustainable interactivity. Female CWS and Pull — The lungs of the pulmonary system obtains from outside-space a resource necessary for the internal circulatory system. Female Transition — Inhaled oxygen (O2) transfers to the internal circulatory system via capillaries in lungs. Oxygenated blood is shuttled to the left cavities of the heart. Female CCWS and Push — With a systolic contraction the oxygenated blood is Pushed out from the heart through arteries and capillaries to nourish the organs and tissues of the body. Female Reset/Rest — After each contraction the heart Rests while it elastically rebounds. Male CWS and Pull — Diastole is a vacuum-like condition by which the heart retrieves de-oxygenated blood from throughout the body, sucking it through capillaries and into veins, and Pulling it into the right cavities of the heart. Male Transition — From there, the blood containing the waste-gas, CO2, moves through a series of valves and into the lungs. Male CCWS and Push — The lungs exhale CO2 to outside-space. Male Reset/Rest — There is a brief pause marking the end of one breath before another breath is taken. The pulmonary system is an open system (acquiring from and exporting into the body’s outside-space). The circulatory system is a relatively closed system (acquiring from and exporting into only the inside aspect of the pulmonary system). As a Subject, the Female causal actor opens the external boundary by CWS and Pulls O2 from the outside-space (Female aspect of pulmonary system). After Her Transition She opens the internal boundary by CCWS and Pushes it to Her inside-space (Female aspect of circulatory system). As Subject, the Male causal actor opens the internal boundary by CWS and Pulls CO2 from the inside-space (Male aspect of circulatory system). After His Transition He Pushes it to the outside-space (Male aspect of pulmonary system). The two systems, pulmonary and circulatory, are coupled together by the actions of cooperating causal agents (one Female and one Male), who exchange OUTput for INput with each other, thereby perpetuating their dynamic feedback. 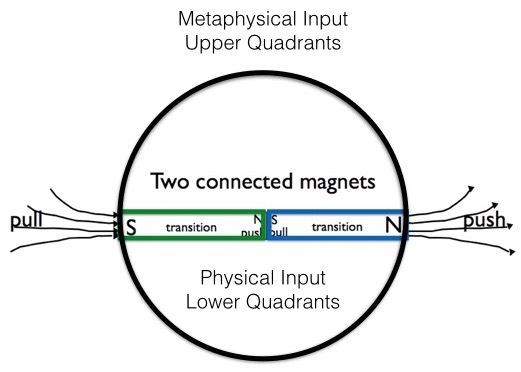 At one end of the spectrum (left side of PS or magnets) the Female Pulls INput (oxygen) from the outside-space, and, at the other end of the spectrum (right side of PS or magnets) Male Pushes OUTput (CO2) back into the outside-space. To an outside observer, the Female Pull of O2 and the Male Push of CO2 are like the opposite poles of a magnet. The opposite ends of the spectrum are sometimes associated with the terms, yin and yang. Although both Female and Male Pull and Push, the Female Pull (yin) and the Male Push (yang) are what bridge between the inside and outside-spaces of their coupled systems. Yin and yang, respectively, refer to the upper-quadrant, open pulmonary system, Female Pull and the Male Push, while disregarding the lower-quadrant, closed circulatory system, Female Push and Male Pull. For investigation into more complex coupled systems, please review the chapter, The Cylindrical Lattice Model of Quadernity. In an unknown or potentially dangerous external environment, we may participate in a larger collective to actually enlarge our Span. The Span of the school shown below far exceeds that of any one of its participating fish. The fish have hidden their individual vulnerabilities by collectively concocting an illusion of ominous opposition sufficient to dissuade potential predators from attacking. Each fish has its own surface area, the exposure of which makes it vulnerable to predators. The external surface area of an entire school of fish (seen above) is far less than the surface areas of all the separate fish summed together. 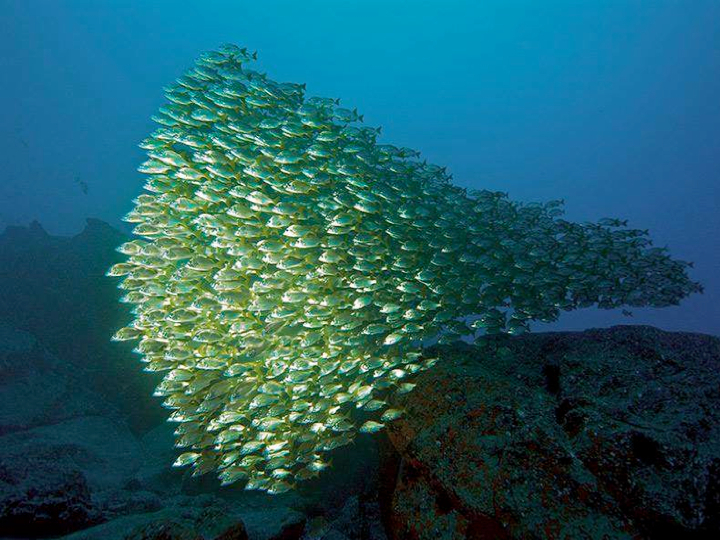 The fish, through cooperation, have doubly minimized their exposure to predators. The tendency of living systems to form multi-leveled structures whose levels differ in their complexity is all-pervasive throughout nature and has to be seen as a basic principle of self-organization. Management of environmental risks and resources manipulates the boundary between an entity/system’s inside- and outside-spaces. A fish has inside-space within its surface/boundary and outside-space beyond its surface/boundary. The collective of fish (the school depicted above) has a well-demarcated boundary that defines its inside and outside spaces. For the benefit of functioning together as a singular, more complex E/S, participating fish must forfeit their usual amount of outside-space (akin to our own ‘personal space’, which surrounds us to the extent of about an arm’s-length radius). The participating fish expel enough of their outside-space to achieve the closest possible proximity for safe, unified navigation. The cumulative, remaining outside-spaces of the participating fish is equivalent to the inside-space of the school as a whole. Inside-space of school Pulls centripetally, holding the fish close together. Outside-space of each fish Pushes centrifugally against the other fish. The balance between the inward Pull and the outward Push is sustained throughout the school’s unrehearsed, but never-the-less, finely-coordinated movements. 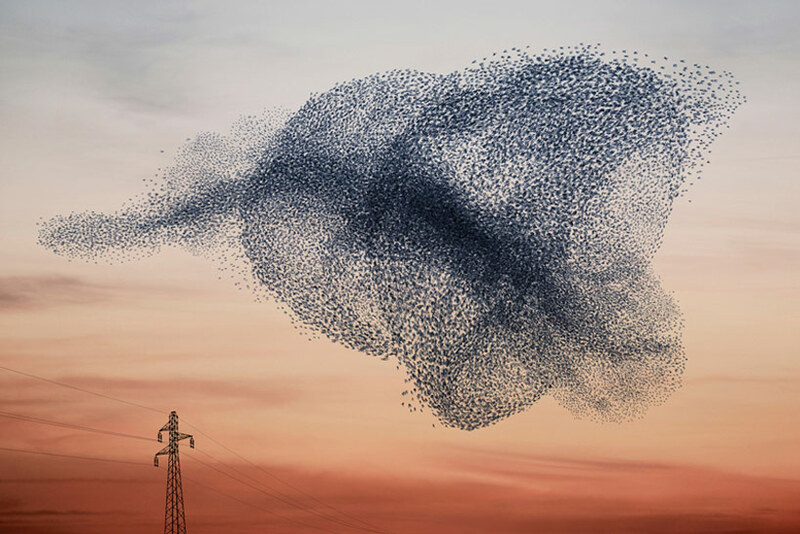 Same goes for the stunning starling murmuration shown below. The expelled outside-spaces of individual fish or birds contribute collectively to the overall outside-space of the school or murmuration. Outside-space Pushes centrifugally; thus it repels interlopers. At the level of Quadernity, physical Earth and metaphysical Heaven become contexts (outside-spaces) for their own exclusive type of content (inside-spaces). Zooming all the way out to the level of an infinite cosmos, we discover that Quadernity is that which relates the content (inside-space) of the cosmos with the context (outside-space) of Eternal Comprehensive Perfection (ECP). Within the “totality of all”, or the ECP, there is an intrinsic dynamic — an irreducible unit we are calling Quadernity — by which the Male–Female collaborators enmind and embody the Absolute. From the Ground state, all dynamical systems appear as pairs of solutes that fall from solution when seeded (inception: Female receives Male in the outside-space, the metaphysical level) and heeded (perception: Male receives Female in the inside-space, on physical level). Everything, from the vastly complex universe down to the simplest infinitesimal, operates within at least one relationship. Relationships may be lateral, as spouses in a marriage, or employees in a cooperative; or they may be hierarchical, as a cell within a body, a planet within a solar system, or a thought entertained amidst a mindset. Relationships are circular, in that each party impacts the other in ways that are either linear or non-linear. Direct associations with blatant, consistent effects become predictable (flipping a switch lights a room, drinking water quells thirst); whereas, indirect associations may subtly accumulate until an abrupt phase change takes us by surprise (global climate change, collapse of a financial bubble, diagnosis of advanced cancer). Even the most minimal E/S would necessarily involve a specific content and its larger context. Every E/S depends upon its own environment. 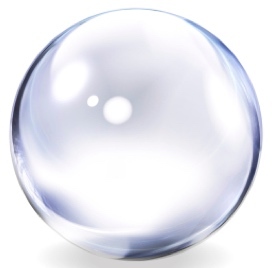 Something as simple as a bubble must still somehow balance structural influences (such as pressure differentials) with issues of substance (for example, viscosity or tensile strength). Full discussion coming up in the next chapter, Brilliance of Bubbles.